Burlington, the county seat of Boone County, is an unincorporated Census Designated Place. The Burlington Post Office is located at 2600 Burlington Pike, Burlington, KY 41005. Photo: Dinsmore_Homestead, ca. 1841, Route 18, Burlington, KY. Listed on the National Register of Historic Places in 1979. Photographed by User:Collopyc (own work), 2012, [cc-by-3.0 (creativecommons.org/licenses/by/3.0)], via Wikimedia Commons, accessed January, 2014. Burlington, the county seat, is situated near the center of the county, and eight miles from the nearest railroad station, Erlanger. The town has about 300 inhabitants, two general merchandise stores, one drug store, a bank, a good hotel, a printing office, which is owned by W. L. Riddell, editor of the Boone County Recorder, one of the best papers in the State outside Louisville; also four nice church buildings. The town is laid off in a square, with a beautiful courthouse in the center. 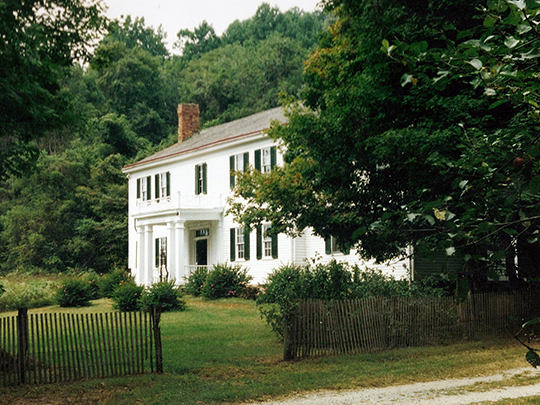 Dr. Kenneth Gibbs, Architectural Historian, Kentucky Heritage Commission, Burlington Historic District, Boone County, KY, 1978, National Park Service, National Register of Historic Places, Washington, D.C.